Pros: A wonderful collection of exceptional actors have been brought together in this brilliant production. Cons: Not many. It is only 90 minutes long; personally I prefer that, but some may see it as not being enough time to cover Ruth’s complex life. To be honest I’m clutching at straws though! 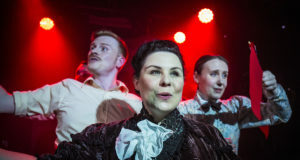 Our Verdict: Supported by thoroughly well thought-out lights, sound and costume, this insightful and brilliantly paced script allows the talented cast of four women and one man to shine in this marvellous production. Ruth Ellis did shoot and kill her wayward lover David Blakely in the streets of Hampstead. There is no question about that – Ellis even admitted it on numerous occasions. Writer Amanda Whittington isn’t attempting to question her conviction; there is nothing new to be discovered by inquiring into the facts that led her to be the last woman in Britain to be executed. What Whittington is attempting to do with this play is portray the real story of a woman who was stereotyped by the public and the press. She does this through the words of those that would have known her best and who, as Whittington explains sadly in her introduction, are silent in the official records. Following Inspector Jack Gale (played by Robert Gwilym) – the only male character to appear on stage – the audience are pulled into a film noir investigation into how Ruth Ellis came to have a gun on that fateful night. This simple question was left unanswered by Ellis until the last moments when it became too late to save her life. Gale (and therefore the audience) watches as memories unfold on stage that really allow the watcher to understand how Ruth became a woman who was willing to kill the one person she thought she needed in her life. Faye Castelow gives the complex character of Ruth the emphasis she deserves. 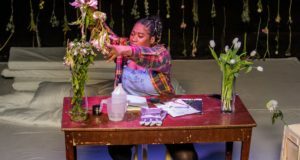 Nothing is simple in Castelow’s performance, and she demonstrates a clear understanding that the character was a damaged human being. She jumps with ease from Marilyn Monroe girlish giggles to an excruciating scene post-miscarriage, all the while keeping the audience emotionally attached to the woman and the events unfolding. Maya Wasowicz is a very engaging actress who portrays Vicky Martin’s rags-to-riches story realistically. Ultimately, the two actresses create a wonderful yet multifaceted bond between Ruth and Vicky that is a genuine portrayal of friendships between women. Whittington’s script is finely balanced. She gives each conversation a very realistic flow and uses dry humour in the places that needs it. This, combined with 1950s style lighting, beautiful costumes and Billie Holiday’s heavy voice on what I think was real vinyl, really produces a beautiful show to both watch and listen to. This is a very special play, and one which finally allows us to understand Ruth Ellis and her motives for doing what she did in a way that we’ve never allowed ourselves to do in the past. The exploration of the understanding of mental health in the 50s is devastating and depressing. One can’t help but be grateful for the small progress this country has made in the last 60 years, both in banning capital punishment and in working towards understanding mental illness. While the show allows us a glimpse into the glitz and glamour of 1950s London, of the champagne parties, the smooth and unmistakable music of vinyl albums and the extravagant women’s fashions, we leave the theatre rather ashamed of how these women, these hostesses, suffered. Ruth Ellis thought she was playing the players at their own game but ultimately not even her strong female companions could save her from her own fragile existence. The Thrill of Love runs at the St James Theatre until 4th May 2013.